The Pierces have survived the battle with Tobias Whale, but Freeland is still healing. With people scared by the new threat posed by teenagers with super-powers (the so-called Green Light Babies) and the attack on Jefferson Pierce's school, there's a movement to shut down Garfield High. As Jefferson battles to save his career and the school he devoted his life to building, Lynn is questioned about her role in exposing the ASA's abduction of the first generation of Green Light Babies, Anissa tries to find a way to help the families suing the government to get back their abducted kids, Jennifer tries to cope with her increasingly uncontrollable powers and Kara Fowdy - the ASA Spotter with nowhere to run - goes after Tobias Whale and his empire. Kara Fowdy's reaction to being harpooned and her jumping out the window is far more goofier than intended. Robert Townsend has a small but powerful role as Dr. Napier Frank - an old friend of Jefferson Pierce's since the Olympics and part of the Freeland School Board. 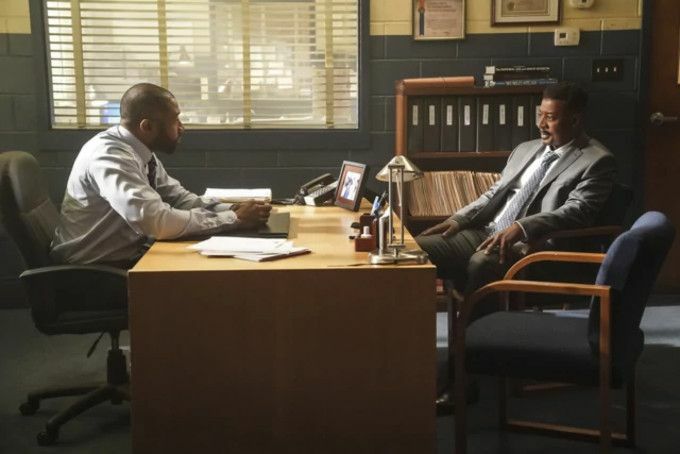 The whole scene between Jefferson Pierce and Deputy Chief Harrison where the police officer reveals that that he figured out Black Lightning's identity is very well acted by both Cress Williams and Damon Gupton. The fight between Syonide and Kara Fowdy is well shot and well-blocked. The final sequence, showing all of the core cast in the build up to Kara's attack on Tobias Whale, is another instance of the show balancing direction and music perfectly. Calling those children developing metahuman powers after using Green Light "Green Light Babies" seems to be a nod to the Bang Babies of the Milestone Comics Universe. There, the term "Bang Babies" was used to describe a number of young people in the town of Dakota, who gained superpowers after being exposed to a chemically altered tear gas during a massive gang street fight that became known as The Big Bang. One of these Bang Babies, Static, is notable for having been meant to be a tribute of sorts to Black Lightning. The two eventually met and developed a student/mentor role in the Young Justice animated series. Jennifer is shown as levitating while she sleeps. In the comics, Jennifer Pierce was capable of true flight. Robert Townsend, who plays the role of Dr. Napier Frank, was also the writer, director, producer and star of the 1993 movie Meteor Man - which was about a school teacher who gains super powers which he uses to protect his inner-city neighborhood... much like Black Lightning. Agent Odell: (To Lynn) You're a liar. You've been sitting here lying to me for about an hour and a half. You know you're lying. You're not going to admit it. And I don't like liars. Not because they lie, because we all lie, but because they make my job harder, and I have enough cow manure to deal with than to have you make my life more difficult. Jefferson: Come on, Napier! You were born in Freeland! We come from the same place. And you know the board has been trying to take over Garfield simply because I will not treat these kids like criminals! Oh, they have money, right? They have money for metal detectors. They have money for guards with guns. But they never seem to have money for books, though, or teacher's raises or core computers. Jefferson: You said it best, Napier. Like Black Lightning and Thunder, I'm trying to save Garfield. Not my job. The episode opens one week after the events of 113. It is said that Anissa and Jennifer's kidnapping in 101 happened three months ago. A young man named Issa Williams is killed by the Freeland Police while resisting arrest on suspicion of being a Green Light Baby. Jennifer is now floating in her sleep, as electricity runs over her body. Lynn wants Jennifer to see a therapist about her powers, while Jefferson wants to focus on training her to control what she can do. Lynn wants to continue studying the children affected by Green Light. Jefferson thinks Agent Odell's advice to stay away is a good idea. Peter Gambi's real name is revealed as Peter Esposito. Kara Fowdy confronts Gambi and asks him to help her escape in exchange for her retrieving Martin Proctor's briefcase from Tobias Whale. Jennifer accidentally electrocutes Lynn in a moment of anger. Lynn goes to Gambi and asks him to pull some strings at the ASA to have Lynn put in charge of monitoring the Green Light Babies in the Cryogenic Suspension Pods. Anissa robs a group of drug dealers and donates their money to the legal fund to free the kids in the pods. Deputy Chief Bill Harrison figures out that Jefferson Pierce is Black Lighting, based on the fact that the only thing that would stop Jefferson Pierce from being at Garfield High when it was attacked by terrorists is the fact that he was already there... and the fact that Black Lightning came out of retirement to save Jefferson Pierce's daughters. Jefferson unmasks in front of Harrison and reveals that Anissa is Thunder. Harrison just walks off, not saying what he will do next. Lynn suggests Jefferson might want to see a therapist too. Gambi reveals to Jefferson that Kara was Proctor's spotter and talks about Kara's offer to get him Proctor's briefcase in exchange for being wiped from the rogue ASA group's records. Garfield High is closed down permanently. Jefferson offers to resign to save the school. Khalil texts Jennifer and leaves a voice message asking her to meet him and listen to him about what happened during his attack on the school. Jennifer's best friend Kiesha reveals that she's scared of the Green Light Babies. Issa Williams, the young man who was killed on camera in the opening scene of the episode, is revealed to have been a Green Light Baby who seemingly ODed and then came back to life as the ASA was retrieving his body. He runs off after his mother says she was glad he died. Agent Odell swears he will find out who pulled the strings so Lynn was put in charge of examining the kids in the pods. Jennifer develops a force-field of electrical energy around her she can't shut off. Jefferson is able to draw the energy out of Jennifer and into himself. The Freeland School Board votes to close Garfield High. Jefferson offers to resign as Principal if they'll allow the school to remain open. Napier agrees to take the offer to them. Kara Fowdy tries to attack Tobias, but he gets the drop on her. She escapes with a harpoon in her stomach. Syonide is killed off to try and make Kara Fowdy seem like a credible threat. Black Lightning returns and its more politically charged than ever, with an opening sequence that evokes the memory of every unarmed black teen killed by crooked cops and the government seizing "criminal" children and keeping them away from their families. It would be powerful stuff, if it weren't for all the powerful moments being negated by over-the-top performances by the supporting actors. I'm also not thrilled that Syonide got killed off just for the sake of making a non-entity character like Kara Fowdy into a threat. Still, I can put up with a lot since it looks like we're getting a live-action Dakotaverse out of it.